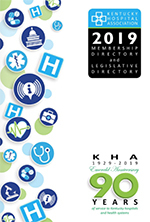 KHA InfoSuite is the on-line data decision support system available to KHA members for obtaining information from KHA’s statewide inpatient and outpatient Limited Data Set. Click here for the latest KHA InfoSuite product information. There are no training sessions currently scheduled. Contact Chuck Warnick for individual refresher sessions or new training for individuals or groups. This secured website is a resource center for KHAInfoSuite users. To access this site, you must have a current KHA InfoSuite user name and password.